A constitutional-reform referendum on tweaking the way a country governs itself, of the type Italy held today, would normally not be a big deal for banks in that country, and particularly not for banks in other countries, and it wouldn’t have much impact on currencies and credit markets. But these are not normal times for Italy, which is in the middle of a vicious banking crisis, and they’re not normal times for the EU either, which has been grappling with a banking crisis of its own, even as it has begun to splinter, after the Brexit vote. And it still wouldn’t be such a huge deal if Prime Minister Matteo Renzi hadn’t pledged he’d resign in case of a “no” vote. Now the Italians have voted “no” by a resounding margin, according to preliminary results. Without waiting for final results, Renzi announced in a televised address to his compatriots that he intends to resign. Renzi admitted that the vote had been a “clear” rejection of the proposed constitutional reform. “The experience of my government ends here,” he said. He’d meet with his cabinet on Monday and then turn in his resignation to President Sergio Mattarella (who might tell Renzi to give it a second thought). Now all bets on Italy’s political, economic, and financial stability are, once again, off. And by extension, the stability – what remains of it – of the Eurozone. Renzi’s resignation, if accepted, could lead to new elections later next year. During these elections, opposition parties that had campaigned on the “no” vote could surge, with the 5-Star Movement gaining additional traction. The 5-Star Movement has long campaigned on an anti-euro platform. While the UK voted to exit the European Union, Italy might try to exit the Eurozone. This will be tough to do, and it will have daunting implications. Alone a serious discussion of this topic at the national level will spread uncertainty and fears of financial mayhem. But until that election, a caretaker government would have to deal with the white-hot banking crisis, and some banks might collapse entirely. The already beleaguered euro reacted immediately, dropping 1.17% to $1.0505, the lowest since the low of March 2015, which had been $1.0457. If it slips below that March 2015 low, it will mark the lowest level since 2003. It currently trades down about 1% at $1.056. The largest 14 Italian banks – not counting the myriad of smaller banks – are sitting on €286 billion of “non-performing exposure,” as the ECB calls it. These loans, debt securities, and off-balance sheet items won’t be repaid. Banks still carry this toxic waste as assets on their books, and writing off this toxic waste and cleaning up their books would crush the banks’ capital officially – though in reality, it got crushed long ago – and take down the banks. So banks have to find new capital to clean up the horrendous mess, but new capital has become scarce, given the horrendous mess. The most urgent case is Italy’s third largest bank, Monte dei Paschi. It has already raised new capital twice in recent years, only to re-collapse. The third time is not going to be the charm, investors have decided. They’ve lost their appetite for losing even more money on this morass. Now, according to the Italian daily Corriere della Sera, reported by Reuters, Italy is in secret discussions with the European Commission to allow a taxpayer bailout of the bank as early as next week. According to the current calculus, the bank needs another €5 billion to stay afloat, or else it might be “resolved” by regulators, which would likely entail some big losses for junior bondholders, which in Italy, are mostly retail investors who’d been suckered into buying these bonds. This kind of bailout would require that Italy can issue bonds a low interest rates. But yields on its government bonds have been rocketing higher, making these bailout bonds much more expensive. So sources at the ECB have also told Reuters that the ECB might boost purchases of Italian government bonds in case of a “no” vote and market mayhem that would drive up borrowing costs for Italy’s heavily indebted government. The bond markets will not be allowed to exude a sense of reality. 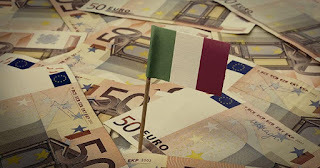 But the already complex – and ultimately very costly – task of dealing with Italy’s zombie banks, after years of brushing toxic waste under the rug, has become vastly more complex in the absence of a government with a mandate. Instability and uncertainty are likely to ricochet from Italy’s banking crisis to the Eurozone and its teetering banks, and beyond. This is not to say that Italians won’t get through this. They will. They’ve dealt with crises, uncertainty, and instability before. They know how to get their money out of the country and out of harm’s way. But what they haven’t done before is foot the bill for their banks’ toxic waste.